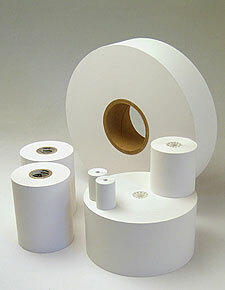 Prime Media Group is a respected supplier of direct-thermal roll media for POS, gaming, kiosk and other applications. We sell finished goods through OEMs, brand owners, distributors and resellers. We source and stock materials from all major mills and coaters, and we can convert to your exact specifications. Technical Help If you need help choosing a product for a particular printer, we're here to help. We understand thermal printing and the issues related to paper performance. So if you need a product that performs in a broad temperature range, has superior printability or long archival life, please take advantage of our industry experience to spec a product that's optimized for your application. Stocking Programs Prime Media generally manufactures on a make-and-ship basis, but we're happy to work with you to implement hold-release, inventory management, and fulfillment programs. Just give us a call and we'll work together on a solution that meets your needs. Contract Converting While most of our thermal products are sold as finished goods, we also act as a contract converter for mills, coaters and other customers who make or source their own media.